The A350 XWB is Airbus’s newest addition to their wide-body line of commercial aircraft. It utilizes advanced building materials such as composites and metal alloys to create a versatile, and economically efficient aircraft. 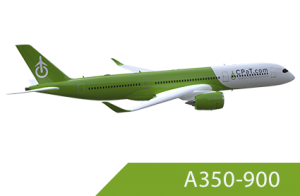 The A350 is a complement to the A330 fleet of aircraft and provides short to ultra-long haul operations. This course provides detailed information on all the aircraft systems to include interactive diagrams and displays in accordance with the manufacturer’s flight manual. As with all our online pilot training courses, this Airbus CBT class includes 24/7 technical support and customer service. This program is designed with a study time of 32 Hours. This run time can be customized to meet your airline’s training footprint hours. Feel free to contact us about customizing this A350 Type Rating course.